Please visit the live demo to try it out. The documentation for this extension is here. 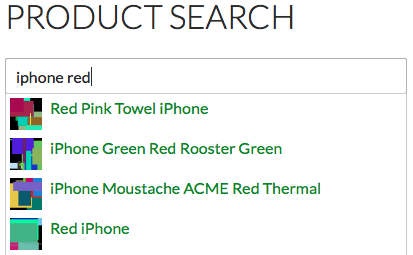 This extension for WooCommerce is available on WooThemes WooCommerce Product Search extension. I’m the developer of WooCommerce Price Based on Country plugin. A customer of mine has informed me of a compatibility issue between your plugin and Price Based on Country. After reading the plugin code and running several tests, I have found the problem and the solution. Unfortunately, I can not apply the solution. The solution should be applied on your plugin. If you’re interested in integrating the two plugins, please contact me. Thanks, sure let’s have a look, I’ll get in touch. Great! That fixed it. Thanks. I have words like Café Latte in my colour section. They load initially fine but then when the extension updates the search the name comes through as CafÃ© Latte. Can you look into this? This is related to an optimization option that is incompatible with your theme’s templates – please see https://docs.woocommerce.com/document/woocommerce-product-search/faq/#section-12 on what to disable to solve it.